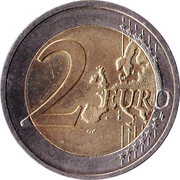 Coin features the world in the form of a euro symbol in the centre, showing how the euro has become a true global player over the last ten years. The surrounding elements symbolise the importance of the euro to ordinary people (represented by a family group), to the financial world (the Eurotower), to trade (a ship), to industry (a factory), and to the energy sector and research and development (two wind turbines). The designer’s initials, “A.H.”, can be found (if you look very carefully) between the ship and the Eurotower. Along the upper and lower edges of the inner part of the coin are, respectively, the country of issue and the years “2002 – 2012”. 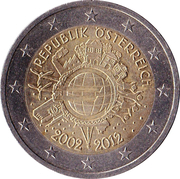 The coin will be issued by all euro area countries. The coin’s outer ring depicts the 12 stars of the European Union. Reeded with inscription. Combination of 2 EURO and *** repeated four times.